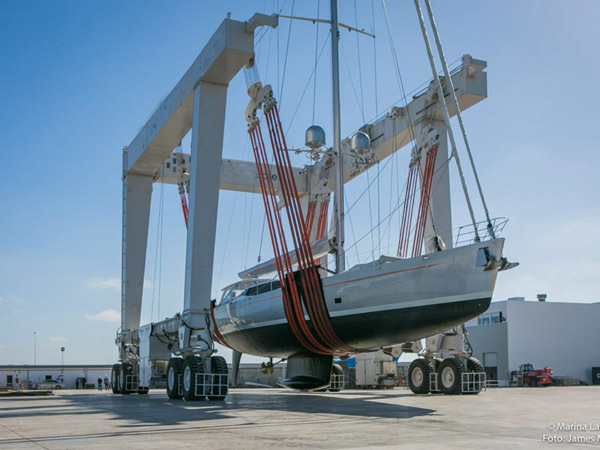 600 ton travel lift is a great lifting device for heavy boat. It has large lifting capacity, complete safety protection devices, durable material, simple system, high safety. With wide application, 600 ton marine boat lift can be used for dock, aquatic clubs, water sport meetings, voyages. This kind of heavy duty travel lift also can be used for lifting and transporting material in warehouse, factory and construction site. Our company, a professional travel lift supplier and manufacturer in China, provide various types of boat lift cranes for sale, such as remote control travel lift, cabin control travel lift, U shape travel lift, straddle travel lift, construction travel lift. Except for standard travel lift, we also have customized travel lift. The design and production are based on practical needs and customer’s requirements. For any type of travel lifts, just send quotation to sales@ellsentravellift.com, we will reply you asap and send u the best price list! 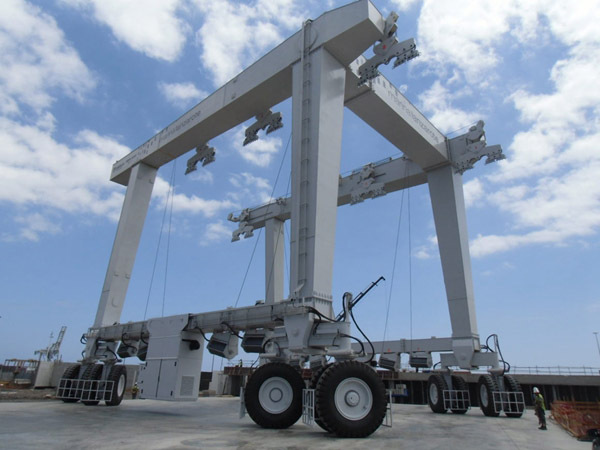 Where to buy cost-effective 600 ton travel lift? As a large lifting crane, the price is usually higher. So the price and the quality are main factors that influence the purchase. Travel lifts from our company are very popular in industry market. We have our own factory, and there is no medium factory between company and customer. This can save much extra cost for customer. To make sure every customer can get the most suitable travel lift, our company provide customized service from design to produce. Every step is strict and meticulous. Our company produce the travel lift according to national standards and industrial principles. With reliable performance, top quality, factory price, our travel lifts win customers’ trust all over the world, and many of them become repeat customers. It is a wise and cost-effective choice to buy our company travel lifts! If you want to get more information about our travel lift types, just visit https://ellsentravellift.com/, there must be a particular travel lift suitable for you! How to prolong the service life of 600 ton boat lift crane? Service life is a key factor for travel lift. It is related to manufacturer, quality, price and producing technology. What are practical methods to extend service life? First, a reliable travel lift manufacturer is very essential. 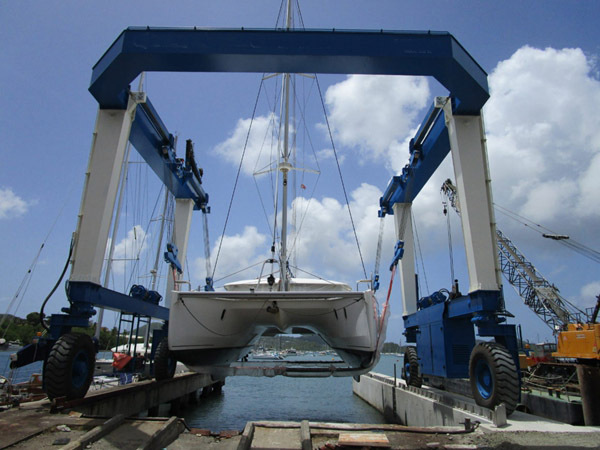 Professional boat lift suppliers always put the quality on the first place. They have advanced technology, strict producing standard, careful attitude and meticulous service. One stop-service, from design, produce, package, delivery, install and maintain, they rank top with professional standards. Second, customers should pay more attention to crane quality. In fact, a good quality travel lift can save much more cost. It has reliable performance and high efficiency, and can finish lifting and transporting work fast and well. With top quality, it just need usual check and maintenance, doesn’t need extra maintenance. Customers don’t need replace the parts frequently. All these can save much expense. Third, take a daily check work or regular maintenance for travel lift. It can help find problems earlier, and customers can take measures to solve the problem in time. The earlier customers find the problems, the less damage will be caused. For heavy duty crane, safe is another key factor. It influences the crane’s service life and operator’s safety. High safety can protect the crane and the operator from damage, and improve working condition. How to ensure high safety of heavy duty travel lift? First, the operator must get the operation license. This is the most basic requirement for the operator. The operator should be familiar with operation rules. Second, every time before and after using the crane, the operator should take a overhaul check and maintenance for the crane. This can help find issues and avoid accident, reduce accident rate, ensure good condition and reliable safety. Third, operate the crane according to the operating principles. This is very important. Over-load, over-speed, standing under the crane, all these wrong actions can cause serious damage to the crane and the operator. Compared with 600 ton travel lift, 60 ton travel lift is much lighter. It belongs to light duty travel lift. It has simple system, easy operation, flexible move and high efficiency. 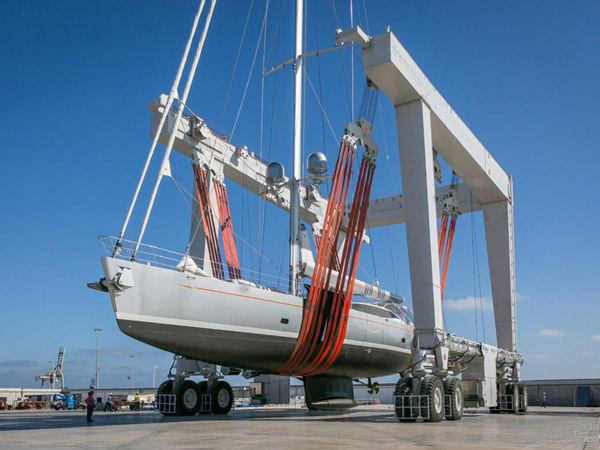 60 ton boat hoist crane is much cheaper than 600 ton vessel hoist crane. For lifting small boat, 60 ton ship lift crane is enough. 600 ton travel lift is a large crane. 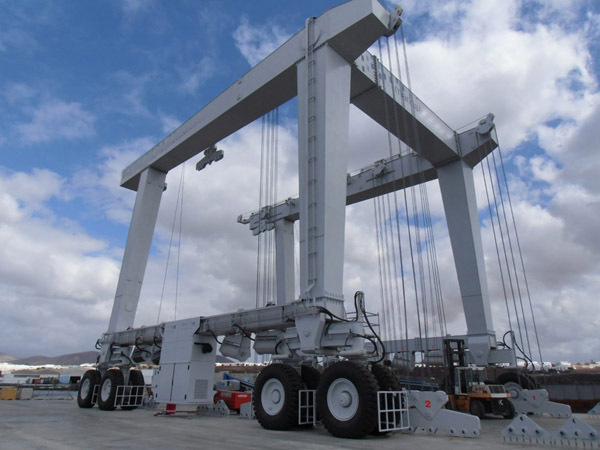 It can lift the boat that is higher and wider than the crane itself. Thus this kind of crane has powerful lifting capacity and great efficiency. The crane is also equipped with reliable safety protection devices. For lifting large boat, 600 ton travel lift is more reliable. Both of these two cranes also have common points. They have remote control type and cabin control type. 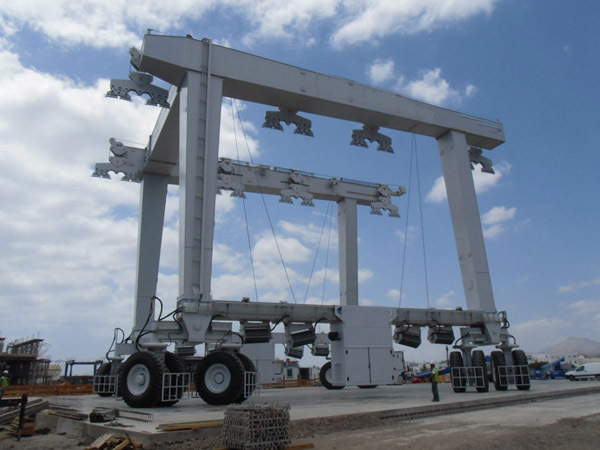 They can be used for marine boat lifting and transporting, and industrial use.